and PAL, and support for 24 bits per pixel (bpp). convolution - the hardware necessary to do this is not present in the machine. the price point of the C610 while still offering 24 bpp. fewer system resource requirements than 24 bpp. is very rarely used. NTSC and PAL timing support are still offered, however. (which was not provided by the Q700). 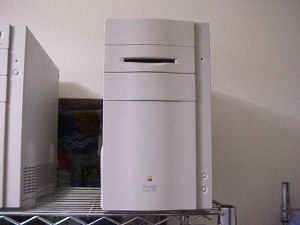 machines (each running System 7.1). display types. For each supported display, the screen resolution (horiz. horizontal scan rates are listed. grounded to the C&VSYNC.GND signal; a value of 1 means do not connect the pin. SENSE1, and SENSE2 in pinout tables for the video connectors. lost beyond the edges of the display, so the entire image will not be seen. of 1 means do not connect the pins. Do _not_ wire any of these pins to ground. produce a color PAL signal, an RGB-to-PAL converter is required. anode towards pin 7, cathode towards pin 10. If your monitor is a VGA type, you can try the following cable pinouts. * Many third party cable vendors have off-the-shelf cables that should work. to see if it meets your expectations. sleeve is flange around the outer edges of the connector (the chassis ground). shell of the card connector connects to the sleeve of the phono-plug. display card), an RGB-to-composite video converter is required. This page was last modified on 10 April 2019, at 11:47.